We're celebrating twenty years of all things Kirby in style with this second edition of Rank Up! Kirby is more known for his hand-held roots than anything, and have the years been kind to Kirby! 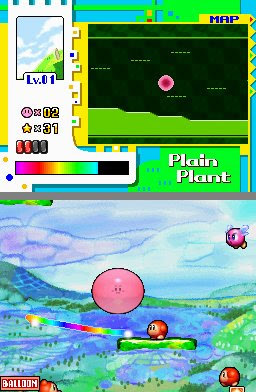 Every new adventure seems like it brings something new to the proverbial table from splitting Kirby into ten to using lines to guide the pink blob around. Here's to twenty more, Kirby! 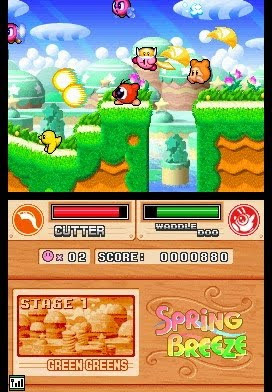 Kirby's very first game, Kirby's Dream Land was before the pink puffball actually became pink. Originally he was a white ghostly blob venturing in Dream Land to save the day as well as gobble up enemies in the process. The reason it is ranked so low on this list is because the game is incredibly short with little in the way of replay value. 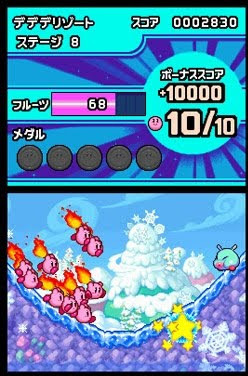 A second mode opens up once the game is completed which is most likely the hardest challenge a Kirby player will ever face. Still, you can't go wrong with downloading this game off of the Nintendo 3DS's Virtual Console. Face off against the sinister Dark Matter and rebuild the broken Rainbow Bridges. But this time Kirby won't have to do it alone-- he has a trio of animal friends to assist him in his journey including Rick the Hamster, Coo the Owl, and Kine the Fish. These animals would return in the much better Super Nintendo sequel of Kirby's Dream Land 3. Regardless, the second installment isn't half bad by any stretch of the imagination, and it features seven worlds unlike the ultra-short original game. All Kirby wants is cake, and when the Squeak Squad gets in his way of his goal, Kirby gets pumped and primed to once again save the day-- and his cake! The main gameplay mechanic of Squeak Squad is the ability to use the touch screen to store five individual items such as new powers, treasures, and food for restoring health. While on the easy side and quite forgettable as a whole, Kirby: Squeak Squad is still worth tracking down if you're an avid collector of Kirby games or ecstatic fan of all things pink puffball. Metroid in design, but that is where the similarities end, Kirby & the Amazing Mirror for the Game Boy Advance takes players on an adventure across nine lands to restore the broken, titular mirror. Call in four friends (hope you have link cables!) or use the computer to assist you in getting past obstacles one lone Kirby couldn't dare get past. Search through labyrinthine levels for treasure, food, and bosses patrolling various shards of the mirror. Getting lost is commonplace in Amazing Mirror as is frustration as this is one difficult game. 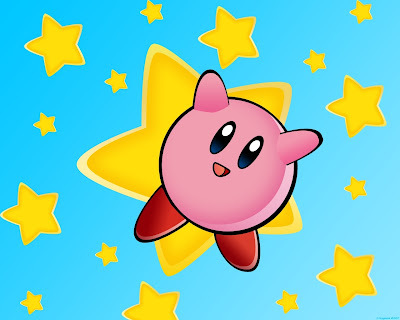 Kirby: Nightmare in Dream Land, the other Game Boy Advance Kirby title, is a remake of the NES classic Kirby's Adventure. It follows the tale of King Dedede stealing the fabled Star Rod and using it for dastardly deeds. Like Amazing Mirror, you can link up with up to three other friends to play cooperatively together or go it alone against bleak odds. The updated visuals are incredibly gorgeous and eye-catching, showcasing that art not high polygon counts matters the most. For a remade masterpiece with bonus content, Nightmare in Dream Land is one dream you won't want to wake up from. A port of Kirby Super Star from the Super Nintendo's heyday, Super Star Ultra on the Nintendo DS takes all of the beloved games of the original collection and adds bonus content to it. There's still all of a Kirby fan's favorite games including Spring Breeze, Dyna Blade, Revenge of Metaknight, Gourmet Race, and of course, the Great Cave Offensive, something that Kirby & the Amazing Mirror reminds me heavily of. In addition to the old, new touch-screen exclusive modes have been included as well. This is the ultimate version of Kirby Super Star without a doubt. One Kirby is great, but ten Kirbys? Yes, please. 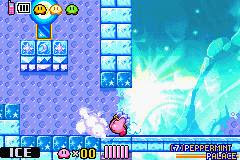 Control an armada of pink puffballs in Kirby Mass Attack. 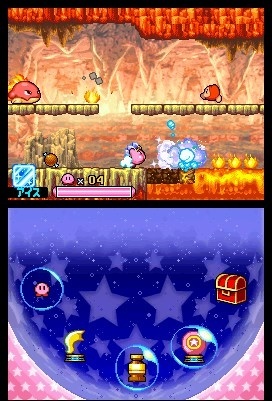 The game is controlled solely with the stylus, having you flick Kirbys at enemies, on switches, and poking the screen to have them move to that location. The main adventure mode of five worlds is only the beginning, There's medals to obtain, challenges to complete, and mini-games to play. These are so astonishing that they could fit into their own game, and no one would be any the wiser! Runner-up for DS GotY for 2011, Kirby Mass Attack is gaming gold. The most nontraditional Kirby game on the list, like Kirby Mass Attack, Kirby: Canvas Curse is also controlled by stylus only. You draw lines to guide the Kirby ball through treacherous obstacle courses, stealing enemy powers, collection three medals in each level, and doing everything in your ability to become a whole Kirby (see: not a circular blob with no hands or feet) once again. 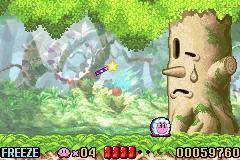 The art style is impressive as it usual is for a Kirby game while the difficulty is just right. This was one of the first games on the Nintendo DS to start the bumper crop of excellent DS games that we saw in the system's first year on the market. With this edition of Rank Up! over, I ask you what would your order of mainline portable Kirby game be? Feel free to go into as much or as little detail as you desire. I appreciate any and all comments. Tomorrow we will have our first review of 2012. Hope you will look forward to that. Yeah dude, if you could help me out, that would be great. Thankfully, I have to Tuesday until s*** hits the fan. You can do whatever you like, and I'll return the favour. Okay. I will wait until I hear word from two possible affiliates, and then do all of the intros in one entry.